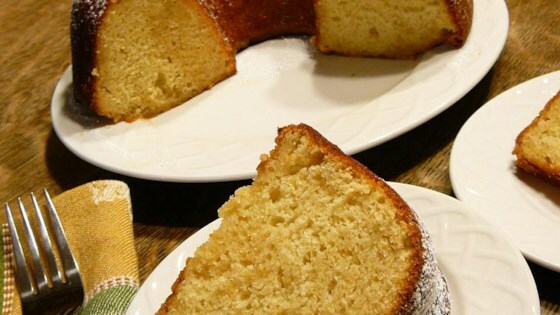 "This is a super easy dressed-up Bundt® cake recipe that tastes like an apple cider donut! It's definitely a fall family favorite in our house." Preheat oven to 350 degrees F (175 degrees C). Grease a fluted tube pan (such as Bundt(R)) with cooking spray. Combine cake mix, 1 cup apple cider, eggs, butter, and vanilla pudding mix in a large bowl; mix until smooth. Pour batter into the tube pan. Bake in the preheated oven until a toothpick inserted into the center comes out clean, about 40 minutes. Stir confectioners' sugar and 3/4 cup apple cider together in a small bowl to make the glaze. Pour glaze over the cake and let soak into the cake and down the sides of the pan, about 30 minutes. Invert onto a plate and cool completely, about 30 minutes. amazing cake-I glazed it after I took it out of the pan. Coworkers loved it!! !